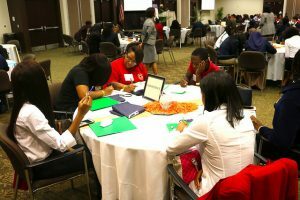 These are just a few topics student leaders at DeKalb County School District (DCSD) discussed while attending the 2018 Career, Technical & Agricultural Education (CTAE) Youth Leadership Summit on Sept. 21. Each year, leaders from DCSD’s career and technical student organizations (CTSO)—DECA, SkillsUSA, Future Business Leaders of America, Future Farmers of America, Family, Career and Community Leaders of America, Technology Student Association, Career and Technical Instruction, and Health Occupations Students of America—meet for a day filled with discussion and leadership exercises. Topics typically center on how to be an effective leader in the upcoming school year. 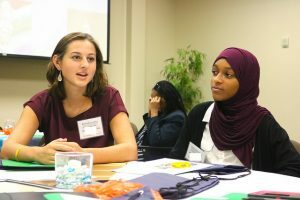 The 2018-2019 CTAE Youth Leadership Summit took place at Georgia Piedmont Technical College. Twenty-two of 23 DCSD high schools participated in the event. Advisors and sponsors for each school were also present to take part in their own training. Della Parson, the work-based learning coordinator for Southwest DeKalb High and Dunwoody High, encouraged students to observe, learn, and demonstrate all knowledge gained at the Youth Leadership Summit at their respective schools and clubs, as it was all relevant and meaningful. Dr. Nicole Rankine of The COLE Academy of Personal Growth and a Stone Mountain High School alum, served as emcee at the event. She kicked off the ceremony with a session titled, “Developing the Leader Within,” focusing on how to be an effective leader and an admirable person overall. In groups, students took turns defining for themselves what leadership means before presenting their results to the entire assembly. As students heard from one another, responses became more introspective and illuminating. “It’s the ability to be respected without being feared,” said another from Columbia High. “Leadership is the ability to influence others without abusing position,” said a student from Southwest DeKalb High. Rankine stressed to students that everything learned throughout the day can be taken back to their respective schools, helping their campuses evolve. Other sessions included “Content of Character,” from Jason Stoughton of Champions Compass, LLC, “Everyone Communicates but Few Connect,” from Cedrick LaFleur of the LaFleur Leadership Institute, “SMART Goal Setting,” from Ella Clark of the Clark Group, LLC, as well as discussions from team members at the John C. Maxwell Leadership Center in Duluth, GA.
Students also participated in thought-provoking exercises. For example, as part of LaFleur’s session, he had students follow verbal instructions on folding and cutting a piece of paper. By the end the instructions, each student’s piece of paper looked different, which demonstrated how to effectively communicate and carry out a task. Stoughton shared his story of overcoming a pituitary malfunction as a demonstration of character over circumstances. LaFleur stressed the importance of communication to carry out essential tasks. Clark emphasized the implicit and explicit effectiveness of goals as both a moral and professional compass. All proved to be equally inspiring for students. For more information on the annual Youth Leadership Summit and DCSD’s CTAE Department, visit the CTAE website.